What a great setting and excellent meals. We enjoyed the hospitality and the fishing. Our bear watch in Katmai was successful as well as three days of great fishing. 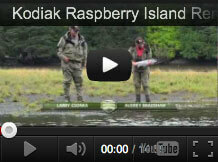 Raspberry….does provide for the complete Alaska Experience. We hope to return soon.